Author L. Frank Baum wrote fourteen full-length books describing the magical land of Oz, including his most enduring and famous work, The Wonderful Wizard of Oz. While written for children, the Oz books included elements of thinly veiled social and political criticism. The Baum's Oz books were written between 1901 and 1917. The Wonderful Wizard of Oz is a children’s book written in 1900 by L. Frank Baum and illustrated by W.W. Denslow. It was originally published by the George M. Hill company in Chicago, and has since been reprinted countless times, sometimes under the name The Wizard of Oz. The story chronicles the adventures of a girl named Dorothy in the land of Oz. It is one of the best-known stories in American popular culture and has been widely translated. Its initial success led to Baum’s writing and having published thirteen more Oz books. Dorothy and the Wizard in Oz is the fourth book set in the Land of Oz (though most of the action is outside of it) written by L. Frank Baum and illustrated by John R. Neill. It was published in 1908 and reunites Dorothy with the humbug Wizard from The Wonderful Wizard of Oz. This is one of only two of the original forty Oz books (with The Emerald City of Oz) to be illustrated with watercolor paintings. 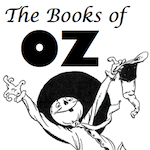 The Emerald City of Oz is the sixth of L. Frank Baum’s fourteen Land of Oz books. Originally published in 1910, it is the story of Dorothy and her Uncle Henry and Aunt Em coming to live in Oz permanently. While they tour through the Quadling Country, the Nome King assembles allies for an invasion of Oz. The Tin Woodman of Oz is the twelfth Land of Oz book written by L. Frank Baum and was originally published in 1918. The Tin Woodman is unexpectedly reunited with his Munchkin sweetheart Nimmie Amee from the days when he was flesh and blood. This was a backstory from The Wizard of Oz.